Reusable brush with medical grade nylon bristles and strong, high temperature resistant polymer stem. Ideal for cleaning Hartmann, Gruber and other Aural Specula. Reusable brush with medical grade nylon bristles and twisted in wire stem. Ideal for cleaning Baron Suction tubes, ophthalmology and neurology cannulas. Ideal for cleaning suction tubes and cannulas from 6 French Gauge (2.0mm) to 12 French Gauge (4.0mm) in diameter. 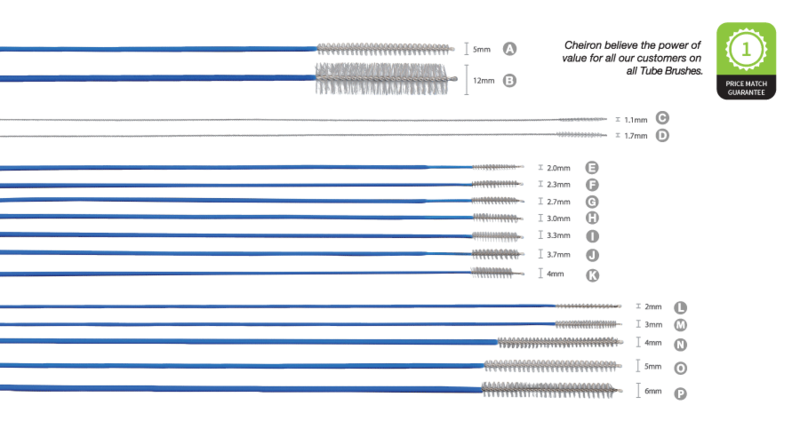 Ideal for cleaning suction tubes and cannulas from 2mm to 25mm in diameter and up to 30cm in length. Products D, E, F, G, H and I refer to the images on the Tube Brushes page.